Choppers - those caricatures of motorcycles with their exaggeratedly long front forks - were born in the US during the Sixties and quickly inspired the Japanese factories to produce Americanized models. 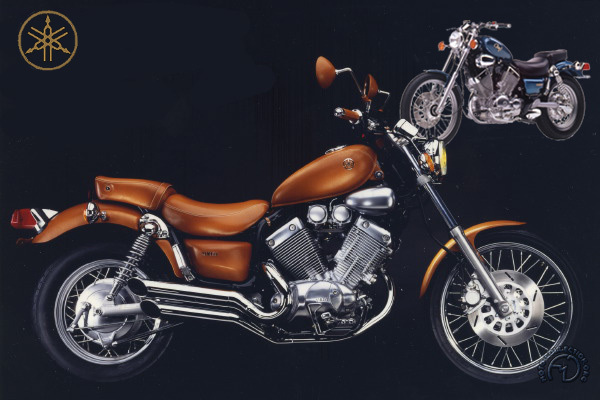 The fashion took longer to catch on in Europe, but nowadays in 1995 custom bikes, represent more than 13 percent of the European market, with the Yamaha :XV535 dominating the scene. With a low saddle height making it easy to handle, the :XV535 keeps its center of gravity as near the ground as possible by employing a cunning plan: the stylish tear-drop fuel tank only holds a 1.3-gallon (US) reserve supply the main 2.25-gallon (US) tank is mounted beneath the saddle. The generous use of chrome plating sets off the engine - which, American style, simply has to be a V-twin, whose torque and flexibility suit such a bike to perfection - to maximum advantage. The combination of good looks, quality and competitive pricing made the XV535, launched in 1987, the best-selling custom bike of its day.